The Flintstones: The Surprise at Dinosaur Peak! is a platform game, and the sequel to The Rescue of Dino & Hoppy (1991, NES). There's 12 levels and your mission is to locate five gemstones to stop the lava flow and reach the stranded Pebbles and Bamm-Bamm. Whereas the original only featured Fred as a playable character, here you also control Barney and switch between them on the fly. Each has unique abilities that are necessary to complete the levels, as Fred has a short-range club and can cling to ledges, while Barney has a long-range slingshot and can climb on poles. Special weapons can also be collected in the form of a Bowling Ball and a Stone Hammer. The level design is above-average with a nice mixture of horizontal and vertically scrolling sections. 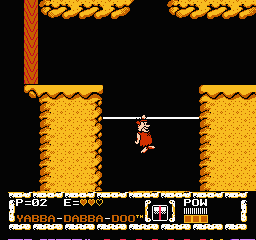 I particularly like the opening level that's reminiscent of Donkey Kong (1981, Arcades) due to the boulders that roll downwards as you climb platforms from side-to-side! There's more variety compared to the original, such as the cool auto-scrolling area where you avoid enemies while surfing, a maze-like cave where you open doors by flicking switches, and even a side-scrolling shooter on the back of a pterodactyl! However, outside of a few secret areas, the level design doesn't really do anything to take advantage of each character's abilities in any meaningful way. Still, the ability to switch between Fred and Barney at will is a good idea and it does add some strategy when tackling enemies. The bosses are simple, yet fun, especially the battle against a caveman where you attack by swinging your club at falling rocks! The one-on-one basketball mini-game returns (along with a hockey variation), which thankfully has more aggressive A.I.! The Flintstones: The Surprise at Dinosaur Peak! is definitely worth a play-through if you're a fan of the TV series or just looking for a solid platforming adventure. While the enhancements from the original game are marginal, and the level design could have used more imagination, there's still plenty to enjoy here. Random trivia: The game is commonly referred to as the second rarest licensed NES title, next to Stadium Events (1987).